Minto Cato introduced the lover’s lament, “Memories of You,” in Lew Leslie’s musical revue, Blackbirds of 1930. Opening at the the Eltinge Theatre in New York, March 4, 1929, the eagerly awaited show ran for only 57 performances. Lew Leslie enlisted the help of Eubie Blake (1883-1983) to write the score for Blackbirds of 1930. Blake was no stranger to Broadway as he had collaborated with Noble Sissle, Flournoy Miller, and Aubrey Lyles on Shuffle Along (1921), the first Broadway musical written, produced, and performed by African Americans. Starring Josephine Baker, Ethel Waters, and Paul Robeson, the musical ran for 504 performances and grossed nearly $8 million. Shuffle Along marked a turning point for the New York theater scene and has even been credited as the beginning of what would be termed the Harlem Renaissance. Blake and Sissle went on to collaborate on the musical Elsie (1923) and the revue Chocolate Dandies (1924). It was during his work on Blackbirds of 1930 that Blake met Andy Razaf (1895-1973). Razaf was well known in songwriting circles for his collaborations with Fats Waller which included the hits “Honeysuckle Rose” (1929), “Ain’t Misbehavin’” (1929), and “Black and Blue” (1929). Blake and Razaf would become a prolific writing team, going on to collaborate on more than 80 songs, the best known of which are “Memories of You” and “You’re Lucky to Me,” also from Blackbirds of 1930. The song first appeared on the charts in 1930, rising to number 18, courtesy of Louis Armstrong. Ten years later The Ink Spots’ rendition reached number 29. The most played and probably best-remembered version, however, was by high-note trumpeter Sonny Dunham, who played with Glen Gray and the Casa Loma Orchestra. “Memories of You” resurfaced on Broadway in the musical revue, Eubie, a biographical show starring Gregory Hines, Marion Ramsey, Ethel Beatty, and Terry Burrell. The show, based on the life of Eubie Blake, opened at the Ambassador Theater on September 20, 1978, and ran for 439 performances. This section suggests definitive or otherwise significant recordings that will help jazz students get acquainted with “Memories of You.” These recordings have been selected from the Jazz History and CD Recommendations sections. 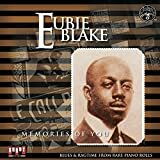 Each of Eubie Blake’s performances of “Memories of You” is worth checking out, and his 1973 solo recording of the tune (Memories of You) is no exception. The tune’s versatility and applicability to modern jazz were cemented in 1956 when Thelonious Monk recorded it for the first time (The Unique Thelonious Monk). Among vocal versions, Shirley Horn’s rendition from 1989 is particularly brilliant in capturing the intimacy of the tune. Blake did not deny that “Memories of You” was inspired by Edward MacDowell’s “To a Wild Rose,” the most popular of the (classical) suite of musical miniatures, “Woodland Sketches.” At the Rose Leaf Ragtime Club website Bill Mitchell wrote a Blake memoir based on diary entries he had made after attending parties where Blake was present. According to a 1973 entry, he said “Eubie spoke of being accused of stealing famous songs such as ‘Gypsy Blues’ from Victor Herbert’s ‘Little Gypsy Sweetheart.’” Blake said he “writes around” songs, but that is not stealing. Blake acknowledged that “Memories of You” was written around “To a Wild Rose,” at least in part. Movement “A” ascends initially step-wise, followed by an arpeggiated outlining of the chord, then a final upward leap of a fifth before descending pentatonically. “B” moves predominately upward in a pattern consisting of a skip followed by three steps. This tune has a very wide range (octave and a fifth) and is, therefore, more appealing to instrumentalists than to vocalists. The initial chord progression is identical to “Doin’ The New Low-Down” and “Easy Living,” being the ascending I-vii˚/ii-ii-vii˚/iii (Eb – E˚7 – Fm – F#˚7) pattern. After this it returns to the I, followed by a II7 that doesn’t really resolve to V7 but goes directly back to the I chord (some versions call for a iv between the II7 and I). Another irregular resolution similar to this one occurs in the “B” section. In the third and fourth measures of “B,” C minor is followed by F7 but then proceeds directly to Eb instead of using a Bb7. Since the melody note in the fourth measure of “B” is the ninth, a Bb13 could conceivably be used during the last two beats, but this is not what Razaf wrote in his original score. Louis Armstrong’s 1930 recording of Eubie Blake’s tune has an interesting feature, aside from Armstrong’s great trumpet and vocal; it is the recording debut of drummer Lionel Hampton on the vibraphone. By the time of his next recording of the tune, with Benny Goodman, Hampton would be considered the master of the vibraphone, his only challenger being another excellent performer, Red Norvo. Goodman’s version of the tune instantly turned the number into a feature for clarinetists, even though there are excellent solos by Hampton and electric guitarist Charlie Christian on the recording. Pianist Thelonious Monk had a special knack for interpreting standard ballads alone at the piano. This is the first of his multiple recordings of this song, and it bristles with energy and creativity. This tune is a duet on an album mostly comprised of quartet numbers, as pianist Byard teams up with Rahsaan Roland Kirk on tenor saxophone. Both of these musicians were known for their personal and compelling ways of combining the cutting-edge with the traditional, and their interpretation of “Memories of You” provides plenty of both. Blake recorded this version at the age of 90. The style and energy are equal to that of much, much earlier versions, and one must assume that we are hearing the song in its purest form. The trio of pianist/vocalist Horn is joined by tenor saxophonist Buck Hill on this thoughtful, molasses-slow rendition. The elegance of pianist Hank Jones is well-documented, and this soulful, harmonically rich performance of “Memories of You” is a perfect example of his ballad style. This arrangement of "Memories of You"' explores the song in a quartet format, allowing for some interesting solos and dynamic interplay. This is a rare treat, for Mingus not only tackles the Blake song but the bass player and composer does it at the piano. This unique recording is yet more proof of Mingus' genius. Bass player Ray Brown highlights the non-traditional jazz instrument here.